It's raining cats and dogs these days, in the part of Seoul where I live. Rainy days make me think of something spicy. On a rainy day, you might want to try some spicy 'Tteokbokki', like me. 'Tteokbokki' can be found in every corner of Korean streets. So you now know that Tteokbokki is a spicy Korean snack, but what else do you know about it? Tteokbokki is Korea's most popular snack food. 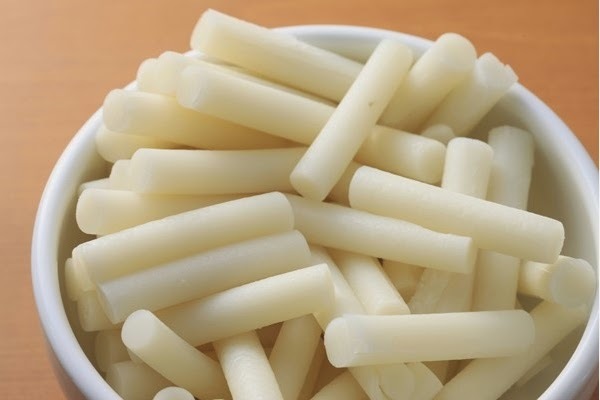 It has cylinder shaped white rice cakes in it. Many kinds of Tteokbokki are spicy - and do you know what makes it spicy? The cylinder rice cakes are cooked with a special sauce made out of 'Gochujang', which is a type of Korean paste made out of red chilli. When sugar, fish cakes, scallion, cabbage...etc. 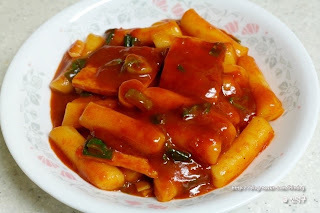 are added to the cooked rice cakes and spicy sauce, a nice Tteokbokki would be done like below. Like many other dishes, Tteokbokki also can be a fusion food. I think it would be great if you try adding these. Tteokbokki is an awesome snack when you want to eat something sweet and spicy at the same time. It can also be a meal if you make a whole lot of it. The chewy rice cakes covered in sweet and spicy sauce might also work up your appetite. Remember, the proof of the Tteokbokki is in the eating!